Well, I survived yesterday. It turns out my throat massage ended up being a scalp massage. At 5:51 AM my little guy came to my bed and said, “Good morning Mommy, Happy Mother’s Day (yes, he was shrieking it)! It’s time for your massage!” Why is it no one is able to get up on a school day that early? So, I’m still alive. A scalp massage was much less hazardous than a throat massage but still, it was 5:51 AM. Ugh. Anyways, here is a little treat I made for myself for Mother’s Day. Mini Peanut Butter-Finger Cheesecakes with a vanilla wafer crust. OMG, talk about indulgence. These tiny little things pack a serious sweet tooth punch. If you don’t have a mini cheesecake pan, I highly suggest getting one. Or this would be an easy recipe to adapt to a larger springform pan. Anyway, I know you’ll love it. Here’s what you will need: Vanilla wafers, granulated sugar, butter, salt, cream cheese, peanut butter, an egg, heavy cream, Butterfinger and chocolate chips. Combine 1 cup ground vanilla wafers, 2 Tablespoons granulated sugar, 2 Tablespoons melted butter and 1/8 teaspoon table salt. Divide mixture into bottoms of mini cheesecake pan and press until flat. Bake in a 350 degree oven for 8-10 minutes or until golden brown. Reduce oven temperature to 300 degrees. Beat cream cheese and 1/4 cup creamy peanut butter until smooth. Beat 1/2 cup sugar, 1 egg, 2 Tablespoons heavy cream and 1/8 table salt until well combined. 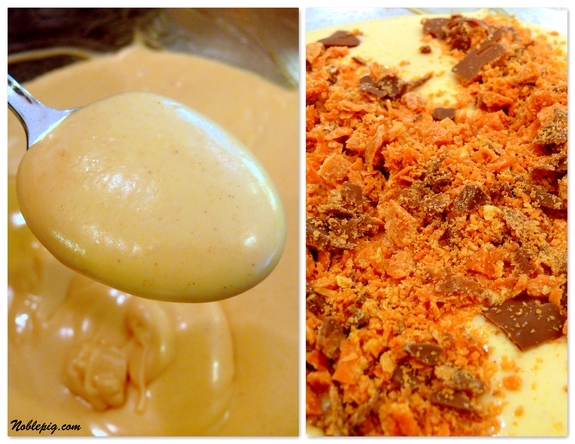 Slowly stir in crushed butterfinger. The recipe suggested 4 fun size bars, I used half of a king size bar or about 2 ounces of Butterfinger. Evenly pour batter over baked crust. Bake for 20-22 minutes until cheesecake is set. Don’t forget to turn down your oven temperature to 300 degrees. Let cheesecake cool for 2 hours, then remove from pan (I refrigerated mine overnight before removing from the pan). After cooling, your cheesecakes will depress a bit, creating a perfect well for the chocolate sauce. Melt one cup chocolate chips in microwave in 30 second intervals. Stir in between intervals and do not overcook the chocolate. Add heavy cream in small doses to the chocolate and stir until chocolate is smooth and glossy. If you add the cream too fast you will get lumps. Microwave some more to get the lumps out. Spoon the chocolate over the tops of the cakes. Spoon crushed Butterfinger over the top of the chocolate. It wouldn’t be hard to eat all four. Mini desserts always taste better than full size ones. Take back any weird Mother’s Day gifts you got and get a mini cheesecake pan. You won’t regret it! Combine 1 cup ground vanilla wafers, 2 Tablespoons granulated sugar, 2 Tablespoons melted butter and 1/8 teaspoon table salt. 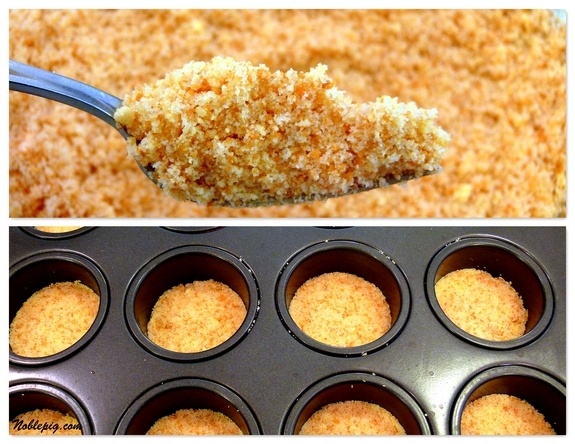 Divide mixture into bottoms of mini cheese cake pan and press until flat. Bake in a 350 degree oven for 8-10 minutes or until golden brown. Reduce oven temperature to 300 degrees. Melt one cup chocolate chips in microwave in 30 second intervals. Stir in between intervals and do not overcook the chocolate. 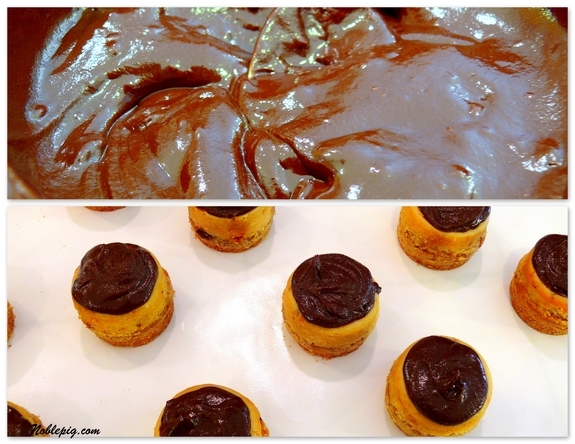 Add heavy cream in small doses to the chocolate and stir until chocolate is smooth and glossy. If you add the cream too fast you will get lumps. Microwave some more to get the lumps out. Spoon the chocolate over the tops of the cakes. Spoon crushed Butterfinger over the top of the chocolate. those look HEAVENLY! i might request those for my graduation party instead of my mom’s triple chocolate cake! omg i’m drooling! I’m comin’ over Cathy..adopt me! is that tray similar to a muffin tray? Looks quite the same, though I suspect the sides must be straight. I’d better google it or I might not sleep tonight! At least I can dream about it! Well done MOM! Cheesecakes children will love too! My Hubby collects cheesecake recipes and has made a few super-rich and delicious cheesecakes over the years. I will add this one to his collection..and I ask again, how do you stay so tiny? Oh, my–if only I’d known, I could have asked for one of these pans for Mother’s Day. 🙂 These are just beautiful and I’m imagining the taste. All I need to do is sub gluten-free animal crackers for the Vanilla Wafers or use my gf brown-edged wafers recipe and I’ll be good to go! These look yummy! Glad you had a good & safe Mothers Day including a scalp/throat massage. I love waking up to this….oh and those boys are c-u-t-e. I wouldn’t have even minded a “Throat” message if I could have ended the day with one of these in my tummy. What is better then Peanut Butter and Chocolate – oh that’s right Peanut Butter, Chocolate and Cheese cake!!!!!! You’re one lucky mommy! Oh Gracious!!!! These look amazing! Those were the cutest little cheesecakes! I bet they tasted as good as they look too. I am happy to see you are still alive, with a good head massage, I see it helped you to come up with a decadent dessert! Mini food has no calories. Right? OMG is right! This is pure decadence itself! Amazing and scrumptious and we moms absolutely deserve this! Happy Mother’s Day! I cannot wait to try this! Really glad about that throat thing being wrong! A scalp massage sounds good. Well…better than a throat massage. And top it off with those little sinful things. Sounds like you had a great day! Wow. My teeth hurt just looking at it! But I’m sure I could eat one or two! Hope your scalp feels great! I bet these are dangerous in mini form. The butterfinger is the real selling point for me – yummy!!! I can seriously taste those babies just from reading the recipe! Criminey these look good. I could inhale them all in one sitting. I seriously could. Holy heavenly yum! I do want one of those pans! I have a mini cheesecake pan an LOVE it!!! This recipe looks to die for (perhaps by throat message? )and I like that it’s scale back to make only 12 cakes. Mini desserts are always best! And as soon as you say cheesecake, much of the world is ready for that, myself included! Glad your mother’s day was a good one. Holy cow Batman, now that’s dessert! Wow, I mean delicious. I have been wanting to order one of those pans. Now I will. Just opening the email and seeing the first picture, made me say “oh, my dear Jesus…” out loud. And I’m a Buddhist! Those look amazing! I just might have to get me one of those pans. I’m speechless looking at these amazing little cheesecakes!! OMG I am so going to make them!!! These are such perfect mini treats! Scrumptious! I’m glad you survived your day. The cheesecake is to die for. that is a cavity in the making for sure. I bet there aren’t any left? how do you stay so skinny??? Too good to be true. Those could be a blessing and a curse in one! Those look so good. I just wish I didn’t hate peanut butter. But, eldest loves them and I’m tempted to make some for her! She can never resist chocolate and peanut butter. Wow – these made me almost feel like I don’t have a cold! Imagine if I actually had some here to eat! Surely I would be healed! I love that!! That would be the ultimate perfect gift for me. It ranks right up there with seeing the kids on Mother’s Day. Oh my! I would love one of these little beauties right now. Butterfingers are my very favorite candy bar. They look fantastic! You have a way with peanut butter and chocolate. These look amazing. I’ve never heard of a mini-cheesecake pan. Now I have something to look for. Thanks. Great photos by the way. Hope the move is going smoothly. Just when I started liking you again. You went and did this?? Your little one is so cute. And this treat is yummy. Have a good day. These should be placed in a new blog Category: Recipes to be made and consumed in one sitting. Isn’t that the truth about kids waking up with no problems on the weekends! All three of mine are up earlier than they have to get up for school. Maybe its the cartoons and video games they get to play while I’m still sleeping! Okay, two things that I must have. Mini cheesecake pans and then these mini cheesecakes!!!! OMG I am going to HAVE to make these! Nilla wafers and Bufferfingers are two of my favorite things!! All I have to say is Oh. My. Lord. I love you, you know that right? Its cute how we who love to cook/bake had no problem making ourselves treats for Mother’s Day! MMMMMM…Butterfingers are my favorite candy bar so these are right up my alley! Yes a carotid (throat) massage would put you out of commission! These ittle cakes are a taste of heaven! What a great treat for yourself. But then again those chocolate covered strawberries would be enough for me! These have got to be the very best looking confection I have seen in ages! I will be making these as soon as possible. Cathy my bum is going to be bigger than the moon if you keep this up. My husband makes me try most all of your recipes. Gah! LOL, glad you didn’t have any throat massage! 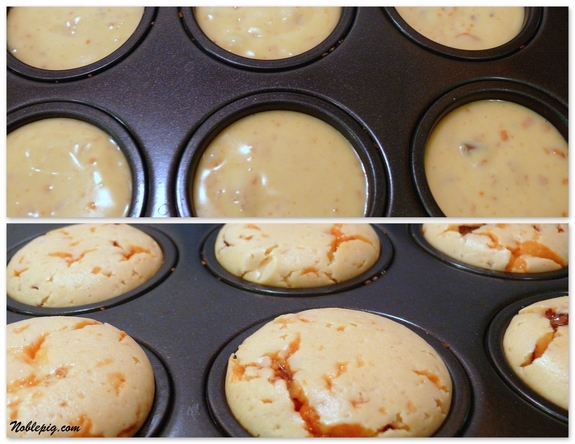 This Mini Peanut Butter-Finger Cheesecakes, look so good, the crust look so scrumptious too. Just saw the pics of your boys and they are adorable!!! The mini cheesecake looks so good…too good. How could I not want to make that. 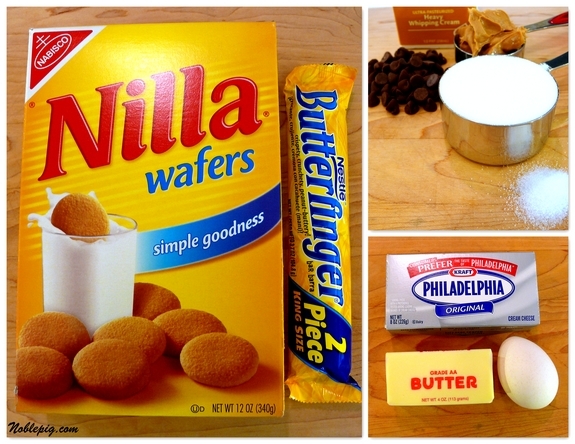 I have to try these sometime soon…love Butterfingers!!! OUTSTANDING! This would be one cheesecake my husband would eat. please, please, please put me out of my misery and tell me where I can get butter fingers here in the UK!!! Or some kind of substiture??? HELP ME!! I need to make these. They sure do look so good. I actually have a Mother’s Day gift I wish I could take back and get that pan instead. You had me at butterfinger – these look absolutely amazing! I’m sobbing right now. Those are beautiful! WOW these look fantastic, oh yeah I could in hale 4 of these, and that would be just the begining!! I love mini-desserts, too. These look amazing – what’snt to like? And I miss being woken up with little ones at the side of the bed wanting to “help.” Enjoy! Oh my lands these look outstanding! I think they would be dangerous to have lying around over at my house. I have never had a throat massage! absolutely decadent. good for you, satisying your own craving, but shame on you, because now i crave some too. i’ll bet the cheesecake factory wishes they had an offering like this. Even with jogging 5 miles a day, I don’t understand why you don’t weigh a thousand pounds! I am impressed! I would like to massage my throat with a couple of these bad boys. MMMM, cheesecake. Oh, Heath bars on top maybe, oh goodness gravy I have to find one of those pans! I almost licked the screen when I saw that first photo. That looks really impressive. That looks like it came from a high-end pastry shop!!! It’s not even lunchtime and I want some cheesecake (although I’m not one to regard the time of day for which it is proper to eat something). Cathy, do you think using a mini muffin pan would work with these? I don’t want to go out and buy a new pan just for one dessert. I love cheesecake! What a great way to spend your Mother’s Day! I bet those were delicious! Have mercy! I WILL try these one day! What a great recipe. You know I’m not sure. I mean, you probably could but the wells in a mini-muffin pan are very small compared to a mini cheesecake pan and the cheesecake pan has removable bottoms. I probably wouldn’t because I don’t think the mini muffin pan would be a very substantial size for this dessert. There are so many recipes available for mini cheesecakes so I don’t think your purchase would leave you with only one dessert option. My opinion anyways. Thanks! I didn’t realize the sizes were so different; it’s hard to tell from photos. Yes, I’m sure I would use that pan a lot if I bought it! I just wanted to make these for a function I have coming up this weekend and didn’t know if I could get a pan before then, but I’m going to try now! If you have A Williams-Sonoma near you, try there. That is ridiculously good looking. A definite must do! Here via For The Love Of Cooking. To adapt this to a regular sized cheesecake, should I just try a regular sized springform pan and add some cooking time? OK, but I STILL don’t know what butter fingers are???!!! It is known that cash makes us autonomous. But what to do if someone has no money? The only one way is to receive the personal loans or just small business loan. If you are willing to buy a house, you would have to get the home loans. Furthermore, my mother all the time uses a bank loan, which occurs to be really reliable. Just a good stuff man u are right at this point. I used your recipe as the basis for a regular sized cheesecake that I gave to our neighbor for plowing our driveway!!!!! It was gorgeous and he loved it!!!!! !